I have a strong attachment to sequins. I believe sequins just brighten up a dull day and keeps anyone in a fun, lively party mood. I particularly love the sequin skirt overlaid with tulle. Tulle can be seen as promy, and too youthful. However the sequin skirt lining creates a festive and mature look. What I also love is the elasticized waistband! Talk about comfort. 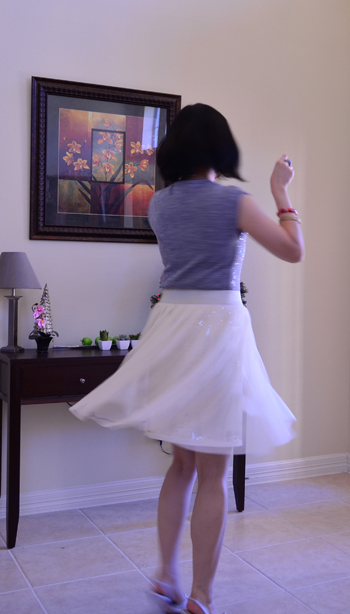 I couldn’t help but do a twirl in the skirt! 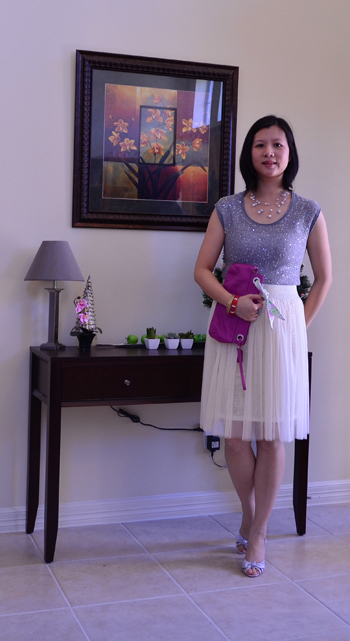 *This outfit is a challenge from Bloggers Do It Better series by Pretty Shiny Sparkly. Love the color of your sequin top. It is such a gorgeous shade and your skirt looks great paired with it. Awesome to have you do a challenge. It’s so fun. These challenges have been such great motivation and such a creative outlet.